Hopewell Indian Mounds at Mound City in Chillicothe is home to the Hopewell Culture National Historical Park operated by the National Park Service. The park protects the prehistoric remains of a dynamic social and ceremonial phenomenon that flourished in southern Ohio's woodlands. We have identified certain characteristics of this particular group of people that lived here between 200 B.C. and A.D. 500 and refer to them as the Hopewell Culture. This particular geographic location appears to be one of the few dedicated areas specifically for internment. Unlike other prehistoric cites found in the state, the mounds found here were almost exclusively part of a burial complex. Unlike other earthworks, the Mound City burial complex, is surrounded by an embankment that is only 2.5' - 3' in height that encloses over 15 acres with 23 mounds of varying heights. It has one of the greatest concentrations of Hopewell burial mounds known today. Within 12 miles of this location there were no fewer than 10 massive mound and earthwork complexes along with numerous other singular mounds which are thought to be part of the earlier Adena culture. In the above survey map created in 1846, the area inside the red circle is the Hopewell Cultural National Park. The blue areas are other earthworks found within 12 miles of this site around the Chillicothe area. There are also numerous dots indicated on the survey which represent singular mounds. The term Hopewell describes a broad network of economic, political, and spiritual beliefs and practices among different Native American groups. That culture is characterized by the construction of enclosures made of earthen walls, often built in geometric patterns and mounds of various shapes. The culture is known for a network of contacts with other groups, stretching from the Atlantic coast to the Rocky Mountains. This expansive network brought materials such as mica, shark's teeth, obsidian, copper, and shells to Ohio. When the mounds were first discovered in the 1840s, they were located in a thick wooded area. Although the earthworks were mapped in the early 1800s by Caleb Atwater, excavations of the mounds were not formally started until the 1840s. When Squier and Davis began surveying the site in 1846, the farmer owning the land had cleared the woods and was beginning to farm the land damaging many of the mounds. Additional mound excavations occurred at the close of the 19th Century and into the first quarter of the 20th Century. In 1917 the US Army built a military camp on the site and leveled most of the mounds. Artifacts that were unearthed at this time were mostly taken by military personnel on the site as souvenirs. After Camp Sherman was dismantled, the largest mound that had been left intact was excavated in 1920. In 1923 the site was established as a National Monument in 1923. Based on early surveys, the mounds were re-created as they were at the time of being surveyed. Much of the information gained from the early excavations is still being used today to understand the Hopewell Culture. When those early excavations were conducted, Ohio did not have a historical society and many of the artifacts were removed from the state. Some of them ended up in European museums, the Smithsonian Institute and even some were acquired by Chicago's museums. Artifacts not recovered during the early excavations were also probably removed by construction crews building a temporary military post. The Visitor Center has a few artifacts, but nothing close to what was removed. The Ohio Historical Center in Columbus has a good sampling of artifacts found at Mound City. 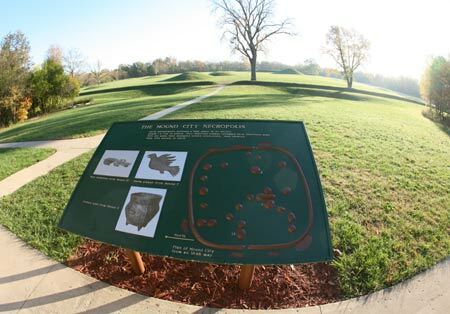 Before visiting the Mound City Group, you should be aware that this park contains one of the largest concentrations of Hopewell burial mounds ever discovered at one site. Although over half of the mounds are recreations of the mounds that once stood there, almost half are not. What that means is that these burial sites should be honored and given the respect they deserve as the final resting places of an ancient culture and their honored leaders. During World War I, a large military camp (Camp Sherman) was constructed in the area and many of the mounds were leveled to accommodate the training center. At that time, the significance of the mounds was not completely understood or appreciated for their historical significance. After the camp was dismantled, the mounds were carefully reconstructed based on earlier surveys, but many of the artifacts included in the mounds were kept as souvenirs or sold. Interpretive trails at the Mound City Group unit have been built, although trails may be slightly uneven due to surfaces of grass, gravel, and wood chips. A 1 mile asphalt trail is accessible at the Hopewell Mound Group unit. You can walk around and through the park, seeing the mounds up close, but you cannot climb the mounds. Be sure to take the short walk to see the Scioto River on the east side of the mounds. This gives you a better perspective on the location of the mounds and its association with this important waterway that connected central Ohio with the rest of the continent in all directions. The park’s Visitor Center is open 7 days a week from 8:30 a.m. to 5:00 p.m. Between Memorial Day to Labor Day the Visitor Center is open 8:30 a.m. to 6:00 p.m. The Visitor Center is closed January 1, Thanksgiving Day, and December 25. The Visitor Center has a number of items for sale, including reproductions of recovered artifacts seen in the museum such as the effigy pipe shown below. The museum is rather small, but does have a small number of artifacts and displays. The park's Mound City Group Visitor Center in Chillicothe, Ohio is located 2 miles north of the intersection of US Route 35 and SR104. Only service animals are allowed in park buildings. Leashed animals are permitted on trails. Pet owners are responsible for picking up after their pet. What is an Indian Mound? The best archaeology information gathered to date indicate that the mounds were part of an elaborate burial construction. Each mound was built over the site of a wooden structure. The remains of a dead Indian dignitary were cremated inside these wooden houses. Often artifacts such as jewelry were placed in the crypts inside the house. As time went by, these houses were covered with layers of soil and gravel. As new generations came and went, additional dignitaries were buried on top of the older elders. Many of the mounds located at the Mound City Group had been destroyed by multiple cultures including most recently, Camp Sherman that was built here in the early 1900s. Camp Sherman (named for Civil War General William T. Sherman) was the 3rd largest training facility in the United States during World War I and it was located here at the Hopewell Indian Mounds. It consisted of 2,000 buildings and more than 20 miles of streets. As many as 40,000 soldiers were being housed there at one time and by the end of the war, over 124,000 soldiers had gone through the camp. In the Visitor Center, you can do a computer search to find information about soldiers who served at Camp Sherman based on military records. 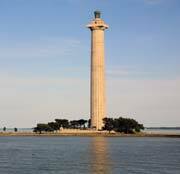 British soldiers captured at the Battle of Lake Erie during the War of 1812 were marched to a prison camp located near the present day Mound City Group.